SPECIAL NOTE: The files created by this new version of Designer 1.7.0.6 will not be compatible with earlier version of Affinity (Designer, Photo or Publisher). You will need to wait for an update to Publisher or Photo 1.7 Beta for compatibility! Please do not use this version if you will be adversely affected by this temporary lack of cross-product compatibility! Temporarily remove the 'construction mode' button in Node and Pen tools.. construction mode will return in a different form in the future! Fix for entering font name in the search area of the font dropdown causing the text to overlay the font name previously shown! I was hoping the point transform tool would allow a quick power duplicate of object based on other objects center. I tried to CTRL+J this and it wouldn't work, it only made duplicates in place. Could we please have this functionality? If you draw a line and place arrowhead at one or both ends, when you draw a shape from the shape collection there are arrowheads on the shape. Is this correct? Question: why are the new beta's not recognised when i use the Check for Updates menu item in the current beta of AD? I prefer that option because it's so much faster than downloading the whole beta file. If it works, of course. This has happened quite a few times already, so i'm wondering why. I think this is correct because you are applying one type of stroke that will be repeated in the next shape you start drawing. I think that is the normal behaviour even in 1.6, but only with stroke. They are testing the betas here in the forum to see how it goes, and when they feel that is stable enough they put them on the auto-update feature! Great work guys! I am pleased to see desktop Designer getting some love!! May I ask if any progress on fixing the bleed omission in PDF export? Many thanks for this "Lock Guides" added to the menus: This affects both tool and ruler editing/creation of guides". Is this in a future 1.7.0 release beta or more like 1.7.x (where x > 0)? Thanks! However, I can no longer move guides by dragging inside the rulers with tools other than the Move Tool (I do have the guides unlocked when trying to do that). Designer keeps getting better and better, I'm almost completely able to move my work over from an aging copy of Illustrator CS6. One item I would love to see incorporated is the option for dashed lines to allow for dashes to be aligned to corners and path ends. I use this a lot when drawing dashed lines in technical drawings as I get a much cleaner result. Is this something that might be added to Designer at some point in the future? If not I'd love to formally put a request in for it :) Thanks! Dashed lines aligned to corners will be coming in the future - it’s already in my plans Thanks for the support! Thanks Matt! Keep up the amazing progress, I can't wait to kick CS6 to the curb for good! 1.6 does not have arrowheads. Personally I'm not convinced that arrowheads on a closed shape make any sense at all, as in theory the closed shape does not have a start or end node (it obviously needs to internally, but logically it makes no sense). 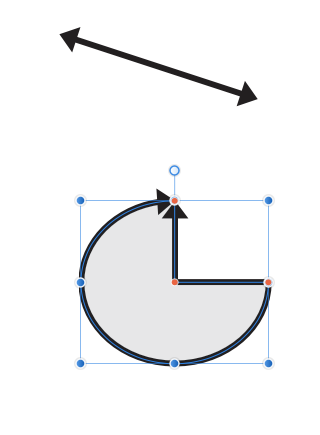 In QuarkXPress for example, if you create a close shape the option to select an arrowhead is not presented - you can't even apply one to a closed shape. If you create an open shape and add them, then close the shape, the arrowheads are removed. If the newly created shape were an open shape, then carrying the stroke forward from the previous one would explain the arrowheads. The problem is that the shape is closed and therefore should not have them regardless. Happy i've updated my ADesigner without any problem. Just noticed noticed the Asset Studio react a bit slower than in previous version, from the time i unfold a category till a time it fully display, takes quite time. Possibly file format causing that. Expand stroke still not fixed Will it be in 1.7 or we have to wait for this crucial function to work as it should till 2.0 or later? I gotta say that the Point Transform Tool is wonderful. I didn't try until today (on Windows), and I fell in love with it instantly. Is there any chance we will ever get a dedicated scale tool? I mean, select anything, objects or nodes, click to set origin and drag to scale (shift-drag to constrain proportionally). To me it’s industry standard. The current scaling options and the new node tool are interesting but limiting.